This is the fifth anniversary edition of the Financial Times’ flagship Global Impact Investing and Philanthropy report. Luminescence has authored the report and provided editorial direction for the project for the past three years. The report provides survey analysis on responses from high-net-worth individuals, family offices and foundations, providing their perspectives on making a ‘more-than-financial’ impact on the world. The estimated wealth of respondents totalled more than £88bn this year. This edition featured an exclusive audience with His Highness The Aga Khan. High-calibre interviewees underpin each report, cementing its status among this target audience and providing unique insights to the wider ecosystem that supports them. Investing for Global Impact is the Financial Times’ flagship impact investing and philanthropy report. Luminescence is responsible for multi-stakeholder management, the overall editorial direction, report writing, interviewing and survey data analysis. As keystone content marketing for report sponsors GIST, Barclays and Cleary Gottlieb, the purpose of the report is to increase understanding of the trends, motivations and challenges affecting wealthy individuals, families and family-run foundations in making financial and ‘more-than-financial’ asset allocations (i.e. those with a social, environmental or other non-financial ‘return’ on investment or endowment). 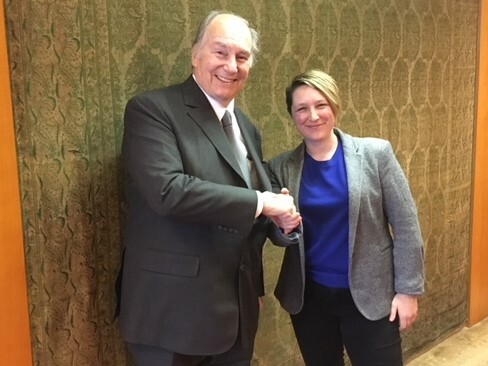 High-profile interviews are a crucial fixture of the global impact investing and philanthropy report, and for the fifth anniversary edition we were able to secure an exclusive one-to-one interview with His Highness the Aga Khan at his residence in Aiglemont, France. His Highness the Aga Khan shared his personal perspective on social and economic development, especially to improve the quality of life for those in the poorest parts of Asia, Africa and the Middle East, and discussing the history and future of the Aga Khan Development Network. During his Diamond Jubilee year, His Highness chose this opportunity to offer an exclusive interview to the Financial Times specifically for this impact investing and philanthropy report. Omidyar Network – created by the eBay founder and his wife – is a “philanthropic investment company”. We interviewed its head of investments, Scott Wu. Tinkergarten is a social enterprise that uses technology to provide early childhood education through outdoor classes and activities, which received investment from Omidyar Network. We interviewed the co-founders Brian and Meghan Fitzgerald. Sarah Butler-Sloss, a member of the Sainsbury family and a passionate environmental campaigner, is founder-director of the Ashden Trust and Ashden Awards. Maja Hoffmann is founder of the LUMA Foundation and a contemporary art collector. She is the daughter of pharmaceutical magnate and renowned naturalist Luc Hoffmann. Erwin Telemans, CEO of the social enterprise Comprehensive Community-Based Rehabilitation in Tanzania (CCBRT), the largest provider of disability and rehabilitative care in the country. The Impact Management Project is a global consortium of 1000+ organisations working to agree basic principles of how non-financial impact is measured. We hosted a round-table discussion with IMP members Ford Foundation, MARS, Bridges Fund Management, AXA Investment Managers and pension fund PGGM. 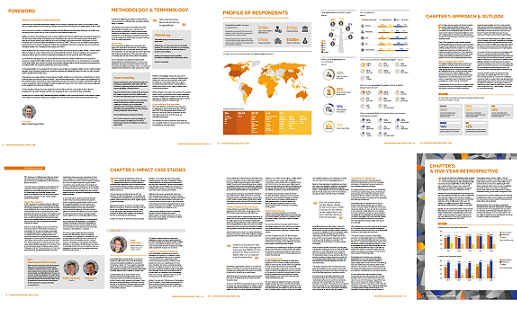 Luminescence has overseen the root-and-branch evolution of the report with each edition of FT Investing for Global Impact, introducing new editorial styles, new design elements, refreshed survey questions, and improved usability of the data-rich thought leadership report. For the target audience, there is typically a lack of transparency about how other wealthy families, individuals and foundations approach and execute their ‘more-than-financial’ contribution, whether through philanthropic activity or seeking both financial and social/environmental impact from investments. As a guiding light, the editorial approach has been to consider what information would be most useful for this audience in providing them with insights into good practice, and transparent and honest considerations of the opportunities, challenges and lessons learned by their peers. Luminescence provides the Financial Times design team with briefings on the desired ‘look and feel’ of the report. This includes editorial layout decisions such as the introduction of a ’round-table’ format, Q&A versus Case Study formats, and the five-year retrospective chapter within 2018’s report. Read a previous case study for this FT report work, including testimonial from Rockefeller Brothers Fund, here. Luminescence has also produced editorial and content marketing for The Economist Group. Click here to view more on its work on philanthropy in Asia for The Economist and BNP Paribas. Read about the keynote address Anna Lawlor delivered about the 2017 Investing for Global Impact report to the FT Family Office Forum last year, click here. “This was the fifth anniversary edition of the FT’s groundbreaking report on the impact investing approaches of families and individuals of high net worth, and the third that Anna Lawlor has written. The project carried substantial sponsorship revenues, and included interviews with high-profile philanthropists and impact investors such as His Highness the Aga Khan, who require professional and careful handling. In addition, the report contains in-depth analysis based on the results of an extensive piece of quantitative research. Anna sifted through a vast amount of information to pick out the key themes and to construct a narrative which will help existing and potential new impact investors to fine tune their investment strategy. Featured in the Financial Times: Matching ethical and financial criteria a challenge for investors.